I always wonder how to start these articles. Do I start with the obvious and state that Battlefield 3 is a 1st person shooter and published by Electronic Arts. Well this article is all about Battkrfield 3 shirts, so I am not going to talk about the background of the game. So I thought I might include some facts you may or may not know about the game. Andy Mcnab penned a tie in novel called Battlefield 3: The Russian. Andy Mcnab served as consultant on military tactics for the game. Battlefield 3 at time of launch was the most successful launch in EA’s history. 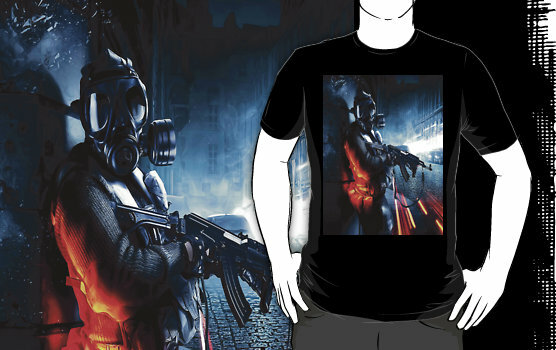 Now let’s get back to the subject in hand that is Battlefield 3 shirts. When putting together this editorial there are a lot of shirts available as us the case with any big selling franchise. I have looked at both official licensed shirts to independently designed shirts that have taken battlefield 3 as it’s inspiration. Are you ready? No really are you ready? Only joking, here is my top 7 Battlefield 3 shirts. A great shirt from the designer tomashawk thomas. This is a very striking design and would look good on anyone. Another great image from Battlefield 3 game. I really like this design. A great addition. This is a subtle t shirt featuring the light streaks from cover game art. A very simple but effective shirt. I hope you enjoyed my list of Battlefield 3 shirts, please let me know what you think of any of these shirts. I better get back to the game.